Unless you’re among those who prefer to drum barefoot or in stocking feet, you’ll find that the best shoes for drumming are those in a snug, minimalistic style. Comfort is a top priority, since any distraction can have a negative effect on your playing. While some players opt to wear shoes made specifically for drumming, others prefer to wear sneakers or trainers. While you can technically wear any shoe you like for drumming, you’ll find that certain features help some brands and styles stand out from the crowd. Appearance –While looks aren’t the most important factor to consider when choosing the best shoes for drumming, it’s important to keep your personal style in mind and opt for a pair that appeals to you. Pick a dark, neutral color if you’re concerned about your shoes standing out. At the same time, keep in mind that your feet probably aren’t on the audience’s radar at all! Your listeners are far more concerned about the sound you’re producing. Feel – The same shoes that feel great while you’re walking or running might not feel fantastic while you’re drumming. Thick soles with lots of traction features tend to get hung up on the pedal(s) and this can lead to problems with everything from speed to performance quality. You want a sole that grips just a little, yet allows you to slide easily. Comfort – Considerations like breathability, weight, and the overall feel of the inside of the shoe will make a big difference in whether it performs well for you. The best drumming shoes fit so well that you don’t even notice that they’re there while you’re playing. Our picks for the best shoes for drumming include a variety of options ranging from classic trainers and sneaks to barefoot shoes. All are favorites with the drumming community and most come in a variety of colors. Converse Chuck Taylor All Stars are a classic favorite with drummers, thanks to their sleek, simple profile, their lightweight and comfortable canvas uppers, and of course their simple good looks. High top All Stars come in a variety of colors and are available in sizes to fit just about every drummer. If you’re not into the classic high top look, you’ll find that these shoes are also available in low top configuration. Who will enjoy wearing these shoes for drumming? If you’re looking for a classic drummer’s shoe in a color that appeals to you, and you’re interested in keeping your look casual, then you’re probably going to like wearing Converse Chuck Taylor All Stars. Take a look around and you’ll find that these shoes are popular with rockers, rappers, and other musicians across the spectrum! We’d like to advise a bit of caution when shopping. 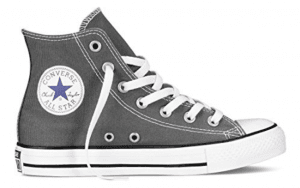 There are a lot of knockoffs on the market, so be careful to select authentic “Chucks” for best results. Puma Speed Cats feature blue suede uppers with a contrasting stripe – perfect for pairing with your favorite jeans. Matching laces make for a comfortable, adjustable fit. These shoes offer a low profile and sleek, rounded toes and heels with classic rubber tire tread bottoms. 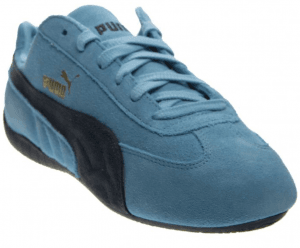 In case blue isn’t for you, you may want to consider similarly styled Puma suede classic leather formstrip sneakers, which come in a variety of colors to suit your personal style.Drift Cat 5 walking shoes are another great choice from Puma. Puma Speed Cats were designed with professional race car drivers in mind. The low profile allows for fast footwork, while the shoes’ sleek yet casual looks are undeniably stylish. Together, these features make Speed Cats popular with drummers across various genres. If you’re interested in something that’s a step up from sneakers in terms of appearance, then you may want to give Pumas a try. With gold details on a black leather background, Urbann Boards Neil Peart Signature Drumming Shoes were designed after Neil Peart wore Urbann Boards drumming shoes onstage during a Rush tour. 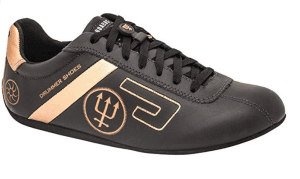 The Neptune symbol, along with four other unique symbols, are used by Neil Peart – they’re a big part of what makes these shoes unique. A special device attaches to the laces, ensuring that they don’t come untied during your performance. A Nano tech rubber sole prevents the shoe from sliding on the pedal. Urbann boards offers a few other designs as well. The Virgil Donati signature shoe is popular with those who prefer a colorful low-top design, while the signature Aquiles Priesteris a great choice for drummers who prefer to wear high-tops. If you’re interested in wearing shoes made specifically with the needs of drummers in mind, then you’ll probably like these. Despite the higher price, they have a great reputation for longevity, particularly when worn exclusively for drumming. The look is unique – you can almost guarantee that no one in your audience will be wearing the same shoes. 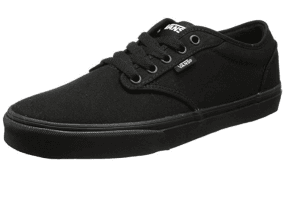 Vans Low Top Sneakers feature canvas uppers, a flexible gum rubber sole with just a little grip, and an adjustable lace up design for a comfortable, customized fit. These sneakers feature a rounded toeand a casual, classic look. If lace-ups aren’t your favorite, you may want to consider Vans slip on core classicsas an alternative. Both styles come in a variety of colors and in sizes to fit most drummers. If you’re looking for good drumming shoes at a moderate price, you might want to consider a pair of Vans. These are popular with drummers not just for their comfortable, breathable feel, but also for their cool appearance. While Vans have been on the music scene for decades, it’s clear that they’re not going anywhere! Vivobarefoot RA II Classic Oxfords feature a classic dress shoe profile paired with a thin, slightly grippy rubber sole that allows the wearer to feel everything underfoot. The lace-up design lets you obtain a custom fit for outstanding comfort. Vivobarefoot offers a few other designs that appeal to drummers. The Gobi II Classic Desert Boot offers Chukka-inspired styling, and comes in a few different colors. The Slyde Leatheris a great alternative for those who prefer slip-ons. If you like drumming in bare feet or socks, but you’re reluctant to keep your “barefoot” look while on stage, then you’re probably going to like the way these shoes let you feel the pedal. They’re far thinner than trainers / tennis shoes, yet they offer just a touch of grip. 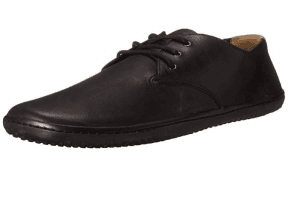 These shoes are also ideal for drummers who prefer the look of a dress shoe over a casual one. Of all the equipment needed for drumming, shoes tend to be trickiest. Some drummers prefer their everyday street shoes, while others need a very specific type of shoe to perform their best. With individual preferences in mind, here are a few more tips for selecting the best drumming shoes for your needs. Sole:Thinner soles will feel strange at first if you’re accustomed to wearing well-padded shoes or boots for everyday activities. It might take you some time to get used to the way your pedal feels and responds, too. But overall, most professional drummers tend to prefer thin-soled shoes or boots. You’ll want to consider doing the same if you’re interested in upping your drumming game. Materials: If your feet tend to get hot and sweaty while you’re drumming, then you may be best off with breathable canvas shoes like Chuck Taylor All Stars or Vans. If you don’t like the look of these shoes, then choose your socks carefully. Many leather shoes – particularly those designed for drumming – get fairly low marks for breathability. Price: Cost is a definite consideration. We encourage you to take a look at different options and pick a pair of shoes that fits your feet while accommodating your sense of style. If the shoes you want are a little out of reach, it might be a good idea to save up. Just like your drum throne, your drumming shoes have a direct impact on your comfort level, which in turn has an effect on your performance. You want to look good and feel great, and if you reserve your chosen shoes for drumming only, you’ll find that they’re likely to last for years.